Fifties Signed Cartier Paris pendant brooch buckle with diamonds and sapphires: Description par door Adin Bijoux Anciens. This 18K yellow gold flower designed and crafted by Cartier is wearable as a pendant, as a brooch and as a buckle. Alternating with five gold petals, five blue petals with a total of 40 sapphires sprout 40 dewdrops as old brilliant cut diamonds, all incrusted in platinum. These petal points meet in the heart of the flower, which gleams of riches from its central old brilliant cut diamond surrounded with five brilliants and five baguette cut diamonds. Style specifics: This type of jewelry is very specific for the fifties of the twentieth century. All sorts of flowers and animals were used as source of inspiration for the goldsmiths. Made in gold and decorated with enamel and precious stones, the result of their labour most of the times well-made, clever and cute. 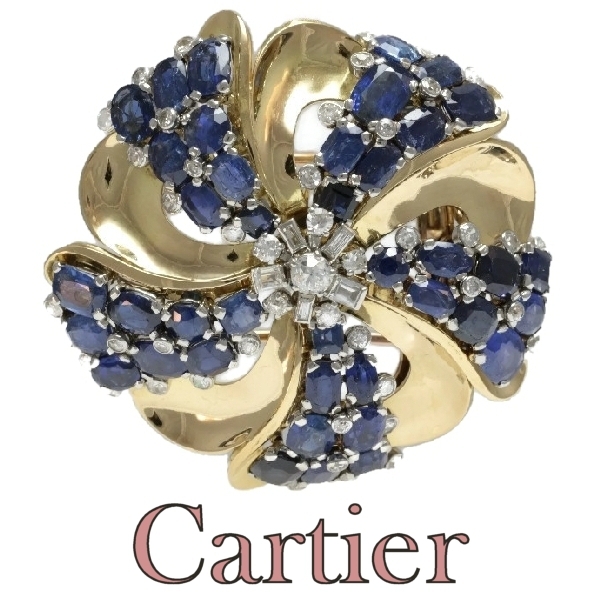 Extra information: Cartier - A leading French jewelry firm, founded in 1847 by Louis-Francois Cartier (1819-1904). Its headquarters are in Paris, with branches in several major centres. The founder was joined in 1872 by his son Alfred (1836-1925), and the latter, with his eldest son, Louis (1875-1942), moved the Paris business in 1898 to its present address, 13 Rue de la Paix. In 1902 Alfred's second son, Pierre (1878-1964), opened a branch in London and in 1903 in New York City. In 1909 the London branch was taken over by-the youngest brother Jacques (1885-1942), by which time it had moved to its present address at 175 New Bond St.
A group headed by Robert Hocq (1917-79) acquired from the Cartier family the branches in Paris (1972), London (1974), and New York (1976). Hocq was Managing Director until his death when he was succeeded by his daughter, Nathalie (b. 1951),who since 1974 had headed the high-fashion jewelry department and promoted the boutique collection of jewelry known as Les Musts'. Originally the firm made jewelry of enameled gold set with gemstones, which attracted a prestigious clientele, including French royalty and the future Edward VII; in recent years it has greatly expanded into new types and styles of jewelry, and is extending its world-wide operations. Diamonds: 45 old brilliant cut and single brilliant cut diamonds (also called 8/8) with a total estimated weight of approx. 2.00 crt. And five baguette (long rectangular) cut diamonds with an estimated weight of approx. 0.50 crt. Precious stones: 40 sapphires with a total estimated weight of approximately 30.00 crt. Hallmarks: The French control marks representing an eagle’s head (that was in use in France from about 1838) next to the dog's head which is the official French hallmark for jewelry containing or made of platinum and that has been used since 1912.